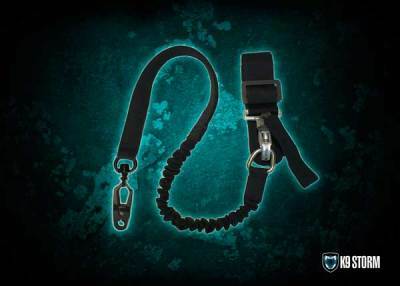 As a K9 Handler, your leash is one of the most important pieces of gear you'll use in the field. K9 Storm Exclusive Aerospace Aluminum Hardware, Mil. Spec. or Biothane Webbing, and a life-time warranty combine to create the first and last leash you will ever need. Learn more info about our leashes below, or hit the buy now button to be transported directly to our store! Have you ever cut your knuckles trying to get an old snap hook off your dogs gear? The Griphook™ is an intuitive improvment of the classic snap hook design and solves this problem by allowing you to send your dog from ALL sides of the leash. It's as simple as gripping it, and ripping it open. Load rated to 500 lbs. 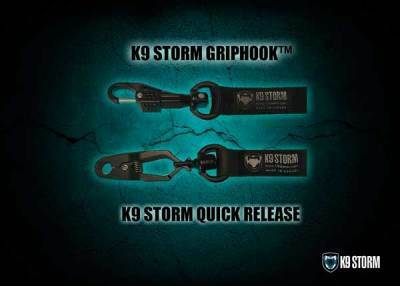 breaking strength, this hardware is ultra-light and has the security of the hook design to prevent accidentally sending your dog if grabbed. Used primarily with military and special forces, the Quick Release (QR) allows for rapid deployments by the simply squeeze of the trigger. Worried about accidental release? The QR design tightens the MORE your dog pulls, to an incredible maximum of 1,000 lbs. The only way to accidently release your dog is if you accidently grab the hardware. Which Leash End is Right for Me? - Need added security and are familiar with the old snap hook? Go with the Griphook™. - Need to rapidly send your dog? Go with the Quick Release. 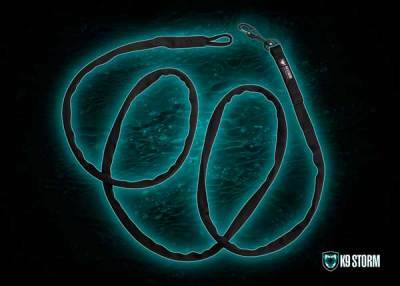 Since 1997, K9 Storm has manufactured our leashes using a custom woven nylon specifically designed for working dogs. The nylon webbing is interwoven to prevent frays and tears when dragging during a track. Our nylon webbing is rated to 2,500 lbs. breaking strength, is extremly light, and is flexible enough to be rolled for easy storage in your pocket. Light: We use a very soft and strong 1" tubular webbing with a rating of 2,500 lbs. It's soft in feel, and folds in your hand as you are working with it. Medium: A single thickness of 1" wide nylon webbing with a rating of 2,500 lbs. It will flex in your hand as you work with it, but is much more stable than the light weight. Medium is our most popular webbing requested by handlers because it offers both flexibility and rigidity. Heavy: A double thickness of 1" wide nylon webbing. It is the same webbing as the medium, but is stitched together along it's length into two layers. It provides the most stability, as it does not fold or flex along it's length. Do you love the feel of leather but hate the weight? Biothane leashes look, feel, and wear exactly like leather except they are lighter and load rated to 1,000 lbs. breaking strength. They are completely waterproof, dustproof, and because of their coating, spikey vegetation cannot stick to the 1" thick webbing. Which Webbing is Right for Me? Like our hardware, both webbing types have their advantages. - Want light weight? Go with the nylon. - Live in a coastal climate or around spikey plants such as cactus? Go with Biothane. 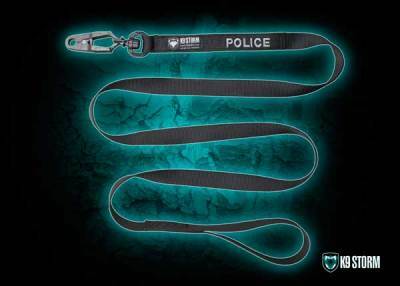 With a webbing length of only 18 inches, the K9 Storm Entry Lead is the ideal equipment choice for K9 control from police vehicles to building search points of entry. The Entry Lead can be easily clipped to a utility belt or tucked in a pocket when the K9 is off-line. Available in medium webbing weight mil. spec nylon or biothane. The K9 Storm Combat Lanyard, an original design that has been exclusive for special forces groups for years, is now available to all. Features include a shooter's stabilization section that minimizes potential shock loads to the handler during combat situations. You can completely disengage from your dog in a fraction of a second utilizing only one hand, which enables primary/secondary weapon access for your free hand. 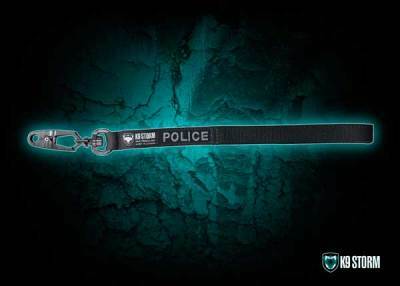 The Combat Lanyard remains flat and secures to any combat belt system. 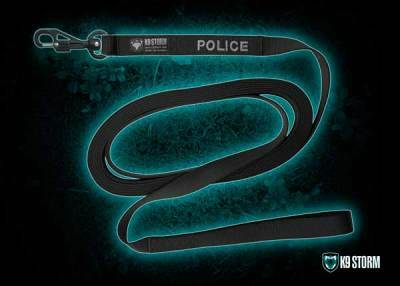 The Assault Line is the perfect multi purpose leash that no handler should be without. 6 ft. of webbing gives sufficient length to work your dog effectively and securely on-line, or release them quickly to apprehend fleeing targets. The K9 Storm Amphibious Assault Line (AAL) features mil. spec nylon webbings and a rugged lightweight buoyant core. Used during water ops, the AAL stays above the water surface and away from fins or motors to keep the K9 safely and securely tethered to the handler. Do you like to go swimming with your dog? The AAL is the perfect accessory for a hands free and secure connection. 20 ft. of line allows you to track in both urban and wooded environments with ease. Need more than 20 ft.? Select custom length and increase the size all the way to 50 ft.